In 2013, the average consumption of alcohol was about 13.5 liters per capita, in 2012 - 15.6 liters. 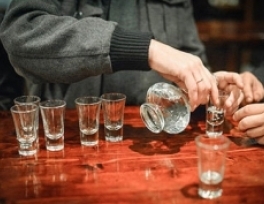 Russian Federation has approved an alcohol and drug prevention policy until 2020. The new legislation goes beyond the traditional focus on health-care delivery to include a concern about population health, setting out the goals of reducing mortality in working ages, especially by lowering rates of injuries and alcohol poisoning, as well as reducing infant and maternal mortality. It also highlights the need for effective action against “socially determined conditions” such as drug addictions, smoking, hazardous drinking, diseases, tuberculosis, and AIDS. The Russian government made emphasis on high technology, greater primary care, reduction of hospital capacity, improvement of management, introduction of new systems of payment for facilities and individual providers of services, construction of cardiology centers and transition to insurance-based healthcare. 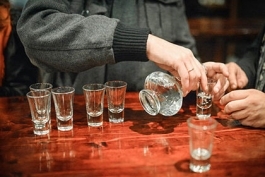 According to Rosstat, alcohol sales fell 1.8 percent from 2012 to 2013, vodka sales by seven percent, with beer and wine sales remaining essentially at the same levels. Earlier this week, the Russian government approved a state program on healthcare development. Among the program’s main objectives are to decrease average alcohol consumption from current 13.5 liters of pure alcohol per person per year (2013 data) to 10 liters by 2020. The Health Ministry that had prepared the program plans to achieve this goal by the concerted motivation of the population towards a healthy lifestyle.